New information about the number of US drone strikes in Afghanistan has been revealed by DangerRoom, the national security blog at Wired.com. According to official US figures supplied to the website there have been a total of 1,160 US drone strikes in Afghanistan since the beginning of 2009. (Note each ‘weapon released’ is counted by the military as a strike; in press reports often several weapons releases at a single location are counted as a single ‘strike’.) This is not the overall total number of US drone strikes as figures have only been given from the beginning of 2009, while US drones have been operating in Afghanistan for several years before that. 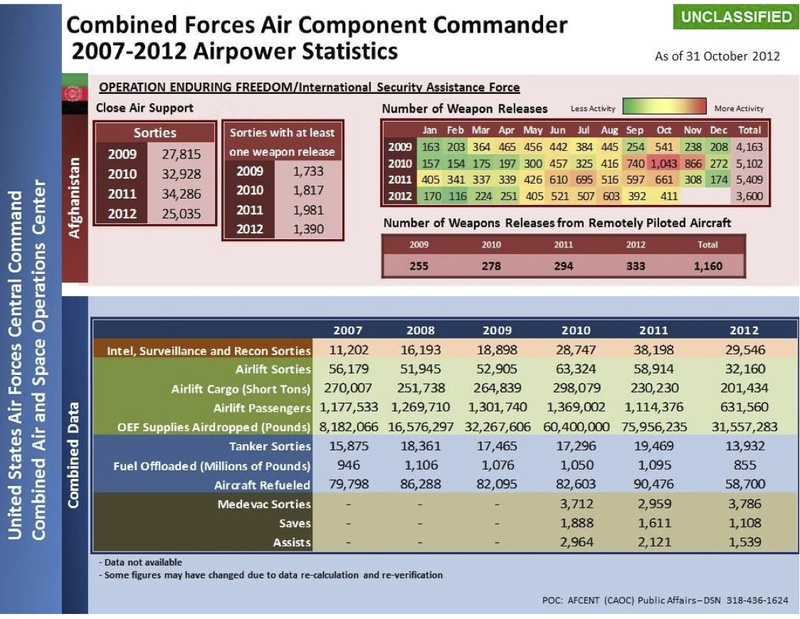 The raw figures give an insight, for the first time, into US drone activity in Afghanistan. Several organisations, notably The Bureau of Investigative Journalism (TBIJ) track drone strikes in Pakistan, Yemen and Somalia. 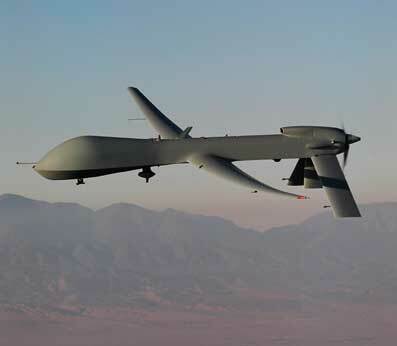 Figures were also released for the number of US drone strikes undertaken in Libya at the end of the conflict (145). However as far as we know this is the first time that figures have been released relating to US drone strikes in Afghanistan. The UK has reported on the overall number of strikes it has undertaken in Afghanistan. 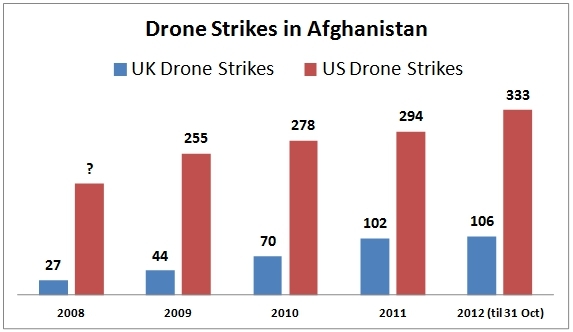 The current figures, given this week by UK Defence Minister, Philip Dunne as 349 since June 2008, means that since the beginning of 2009 there have been almost 1,500 drone strikes in Afghanistan.